Nectarines, like peaches, originated in China over 2,000 years ago, and were cultivated in ancient Persia, Greece and Rome. Nectarines are distinct from peaches in only one recessive gene, which makes their skin characteristically smooth. 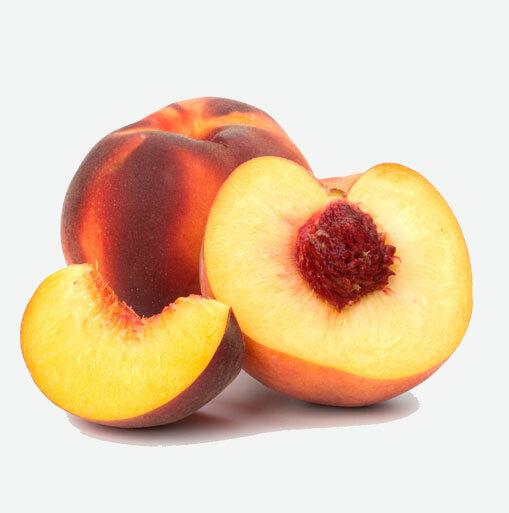 Nectarines belong to the Rosaceae family, as do peaches. They are round, sweet, juicy fruits with smooth yellowish-red skin and a rough stone. Nectarines are high in dietary fiber, which the body needs for normal digestion. They are a great source of vitamin A, which studies have shown protects against many forms of cancer. They are also low in calories, which makes them a sweet treat for dieters. Nectarines are small enough to pack in your purse for a quick snack but huge when it comes to delivering nutrition. When you purchase nectarines, look for ones with a creamy to gold undertone—this indicates ripeness (green colour indicates immaturity). The amount of red on nectarines depends on the variety so this is not always a sign of ripeness. Pick fruits that have a well-defined crease and a good fragrance. Ripe nectarines will also give to gentle palm pressure. Shriveling at the stem end or excessive softening are indications of overripe nectarines. Nectarines will keep for up to three days, but you need to be very careful, as one small bruise will cause the fruit to go bad quickly. Remember to wash nectarines well under running water before eating or preparing them! Nectarines are good by themselves or in fruit salads, pies, fruit kebabs, and smoothies. Try nectarine crisp, or chunky hot nectarine sauce over plain vanilla ice cream. For a sweet treat, fill a deep pie dish with sliced nectarines, cover them generously with brown sugar and pop into a scorching grill for a couple of minutes until sugar caramelizes. You can then serve them with creamy vanilla-flavoured yogurt.